Well, it is mid-June, and the tourist season is kicking off in Maine. The island’s population is slowing growing, but by the beginning of July it will be booming. It is great to have old friends returning, and it seems like each day, there are more summer folk, and day trippers, arriving on the ferry. Of course, it is around this time of year that plans for the ICCA and CCCC AGM’s get finalized. This year, we are hosting both clubs, and we are excited to share Maine with all the attendees, but moreover, to host those that are attending on the island we call home. 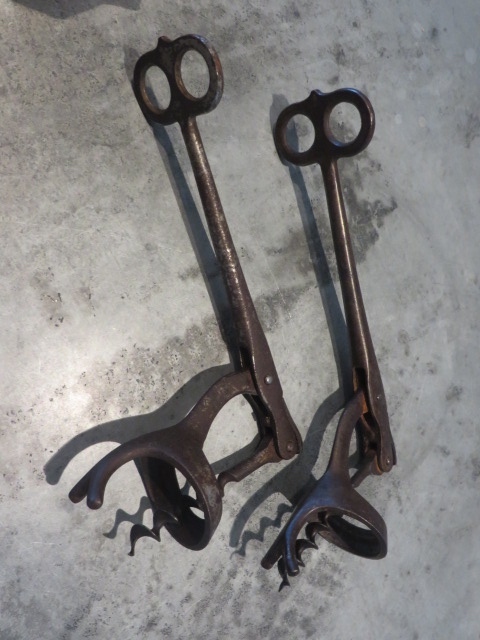 And, given that we are halfway through 2018, I was thinking about the best 6 corkscrews thus far for 2018. 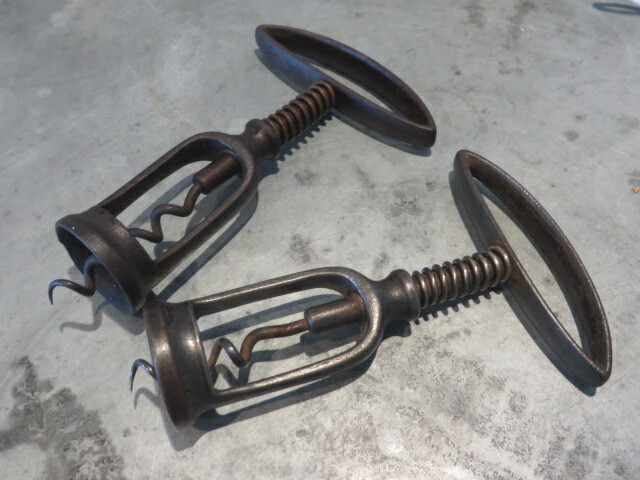 While corkscrew news has been a little slow as of the last couple of weeks, it has been a pretty good year so far in acquiring those twisted treasures we covet. I did pick up a Jenner patent as mentioned in a past blog, but given it is missing a portion, it is more of a place holder waiting for a complete example. Of course, we still have half a year to go, and you never know what might turn up next. The hunt will continue, and we look forward to seeing all of you in Maine. The lovely personal personal trainer and I headed off to Chicago for a few days recently, to visit with Tommy; see his new condo, visit the old neighborhood, visit a few favorite restaurants, and of course to see his collection. These are on their way to the island as I type, and I will report back if there are any interesting markings on the pieces when they arrive. The travel to Chicago was pretty seamless, and Tommy swooped in and scooped us up. And, soon enough (he brought chilled wine and cheese with him) we were eat the condo we were renting for a few days. 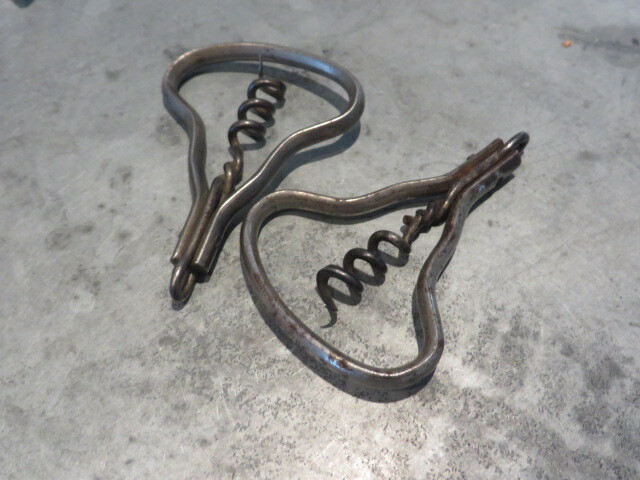 Of course, TC also brought a few corkscrew with him, and there were some fantastic recent finds. After the happy hour show and tell, we headed off to Bandera for dinner. One of our favorite restaurants on Michigan Ave, and the meal (the Cliff Lede wines) didn’t disappoint. The following day, lovely and I decided to walk to Navy Pier. We don’t usually frequent that as a destination, but Nick Cave was giving a performance, and we knew we had to see it. And, walk we did. Meandering from Andersonville towards Wrigley field, stopping by our old condo in Boys Town, then heading towards Lincoln Park, the Zoo, and then heading on to the lakeshore to walk downtown, we made it to where the performance was being held with 15 minutes to spare; where there was cold wine available to bring into the auditorium! Following the performance, and having walked 9.1 miles to get there, we grabbed an uber back to the condo, picked up some wine and cheese, and had another happy hour with TC before heading to RL (Ralph Lauren’s restaurant) for dinner. After getting back to the condo, we shared goodbyes, and see ya tomorrows, as the next day we were going to hop on the train out to Elgin to see Tommy’s collection and condo. Hopping on the El, we were soon at Union Station where hoped on the Metra to Elgin. Tommy picked us up, and after a requisite stop to pick up some wine, we were soon pulling into Chez Campnell. Having only recently moved in, there are boxes and boxes of corkscrews to go through, but there were plenty to see, examine, drool over, and there was almost a deal made for a couple; an unusual Murphy and an Atwood Combination Six. The deal wasn’t made, but you never know what trades might happen at a future date! After lunch and corkscrew viewing, we headed off on another adventure; looking at potential corkscrew cases for our corkscrew room on Vinalhaven, and then hugs and goodbyes and see you in a month (when Tommy visits Maine) and then it was back to the train. Knowing we had an early morning flight the next day, the lovely and I had an early dinner at Le Colonial (another one of our favorite places in Chicago) and then made our way back to the condo. A great few days with the lovely and TC in a city that we love. Thanks for a great visit TC! As you may have noticed, I haven’t blogged in a while. As it happened, the lovely personal personal trainer and I headed off to California for a few days to visit the wine country. There was much wine tasting!!! And, a bit of wine drinking as well!!! 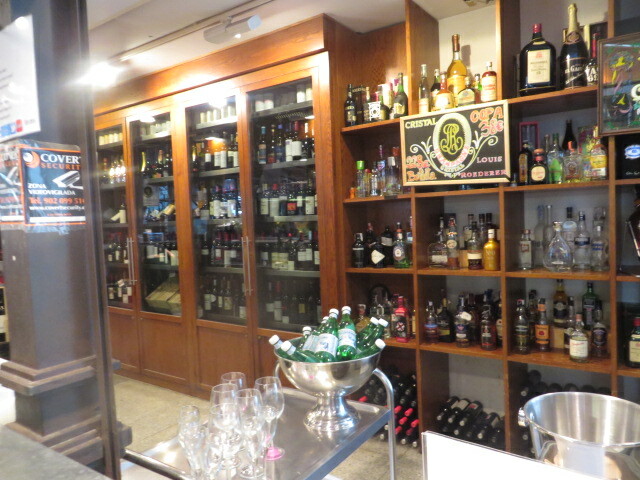 It was a fabulous time, and we did manage to do a little antiquing as well, but alas no antique corkscrews were found worth buying–well, except for the Frary Gundlach that adorns the walls of Gundlach Bundschu. Of course, that one wasn’t for sale. Meanwhile, after a little perusing of our second favorite auction site, I managed to find this lovely little tap. PIX EXCLUSIVE CHAMPAGNE TAP, from the Albert Pick Co., Chicago. Anyone have any history or background on this one? A cool little tap that is enroute to the island. 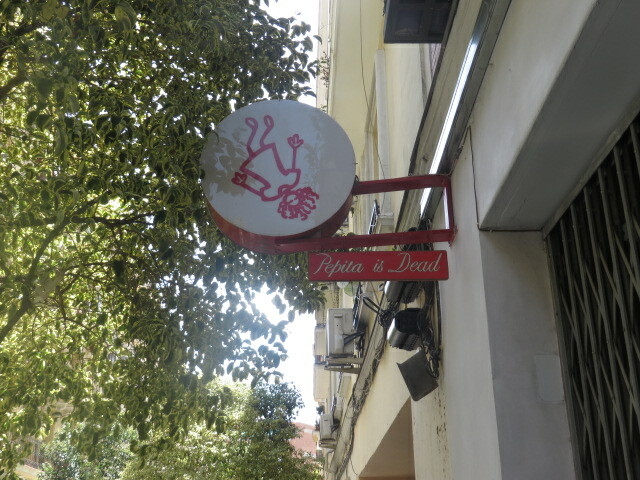 So, whilst traipsing around Madrid over the last few days, the lovely personal personal trainer and I came across this shop (which was closed, as it is August) Pepita is Dead. As it turns out, while still closed, Pepita is Dead is a vintage clothing shop that has some notoriety. Their website is currently being worked on, but check it out. On a corkscrew note, Tommy and Joey arrived yesterday, and we scooped them up at the airport, and made it back to the apartment. This was no small task, as when we headed over to the Metro to board the train that would take us to the next train that would take us to the airport, we came to understand that our Metro stop, and those in either direction for a mile + were all closed for renovations. Okay, after taking the elevator down to the depths of the city, take 6 escalators–or alternatively stairs–whilst following signs for the number 10 bus. Only to find that the number 10 bus, doesn’t say number 10 anywhere on it. But, what the heck. we boarded, went a few miles to a different Metro station, and descended under the streets again. From one platform to another platform, to a set of stairs, to another set of stairs, to yet another escalator, past two more platforms, to what appeared to be the right train. Except when you got in the train which was supposed to be the number 10, it read number 7. We looked at each other, and decided to stay on it, as it had to be right. Maybe they use this train for multiple lines. And, it was only two stops from where we would transfer anyway. First stop, was the right one. Okay, we are heading in the right direction. Next stop, Nuevas Minesterios… perfecto! Okay… we had made it that far. Now, just find the pink line. Within a few minutes the number 8 (pink line) arrived, and we got on board–along with lots of people carrying, pulling, or dragging luggage. This seemed to be a pretty good sign. As we neared the airport, the map on the train showed to airport stops. Terminal 1, 2, & 3, or Terminal 4. Not knowing what terminal Tommy and Joey would be landing in, we opted for the 1,2, or 3, as not only were we picking up Tommy and Joey, we were also picking up a rental car with which we would pick up Tommy and Joey. The train pulled in, and we started walking towards the terminals–terminal 2, as the arrivals indicated that is where the flight from Frankfurt would be; only to find out that all of the rental cars are located in terminal 1. No worries, we headed over looking for our rental car company, who as it happens, does not have a location in the Madrid airport. So, we went over to the Hertz counter and asked where Dollar rental car was, and he responded with “right here.” Apparently various rental companies will take the reservations and the cars are handled onsite by combining their rentals. After filling out the appropriate paperwork, we hopped in our vehicle and made it out of the rental car area, and into the arrivals at Terminal 2; at precisely the time when Tommy and Joey landed. And, after a short wait at the arrivals, I saw the boys pushing their luggage through the doors, and I lead them to the car. Now… how to get back to Madrid proper and the apartment. As it happened, the lovely and I headed over to the Vodafone store two days ago, and she had her sim card changed out on her iPhone, so she has fabulous service. So, Daphne (as we have named the voice on the iPhone maps app) guided us to our front door. Up the four story walkup with their bags, and we had made it! 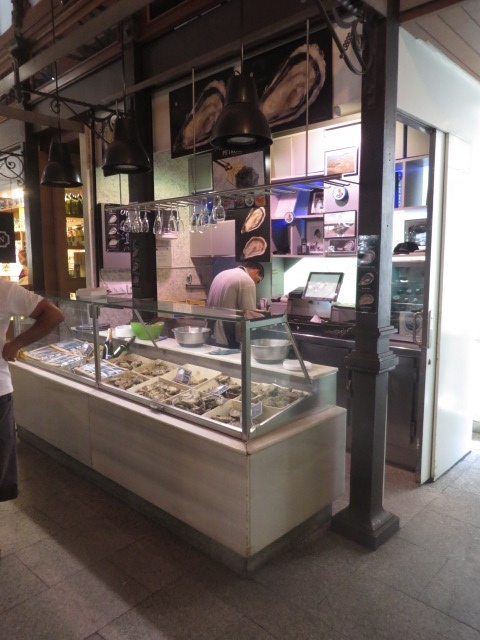 So, after the briefest of breaks, we headed out (on foot) for lunch–eating that the restaurant above Mercado de San Anton. This was followed by a trip to the aforementioned vodafone store in the pursuit of additional sim cards–apparently their system was down however, and no sim cards were being sold. In Puerto del Sol we boarded a tour bus, and they guys got a nice overview of the city. And, after the tour, we started to walk back home. 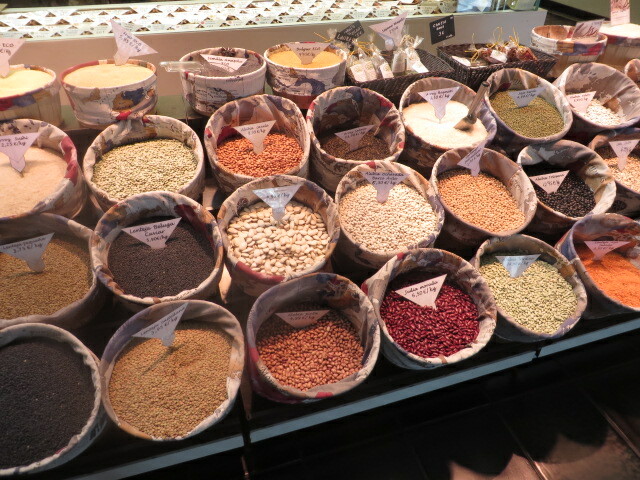 After a while we discussed eating in rather than going out, and knowing the jet lag was hitting the guys, the lovely and I headed off to a local market where we picked up food and wine, and came back to make dinner. 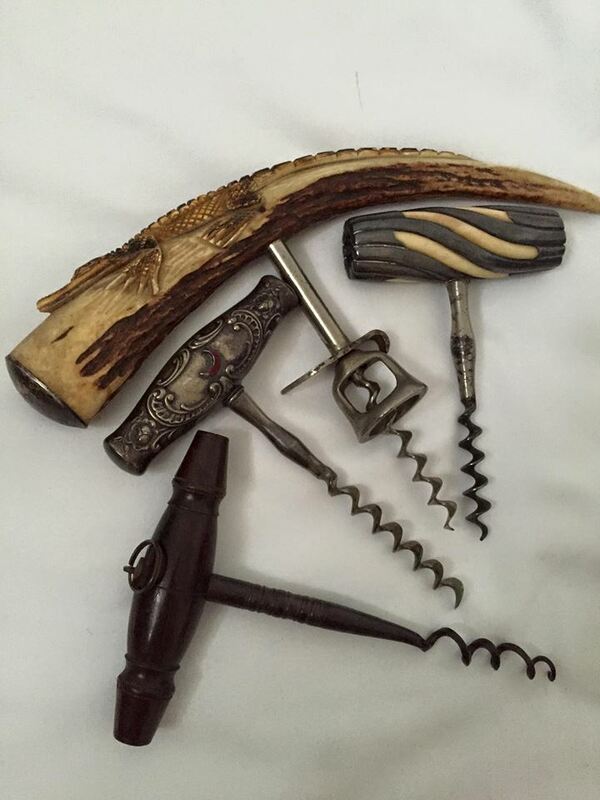 And, while we were prepping and cooking, I took a break to bring out some corkscrews for Tommy to look at. He went through the box, and pulled out a couple, and asked how much. He made a fairly decent offer, and I suggested an extra 50 dollars. He wasn’t budging, so I suggest we flip for it. However, instead of a 50 dollar flip, it became a 100 dollar flip; my price if I win, 100.00 less if I lose. So, there is a fairly substantial wad of cash, a Walker patent peg and worm, and the results of the flip hanging in the balance–or flipping int eh balance as it were. I grabbed a coin, and TC called it in the air. I will preface this section of the blog by saying, I have never seen Tommy actually win a flip–maybe he has against TWJ…so, I figured my chances were pretty good. So, the coin in the air flipping downwards, I catch it in my hand and flip it over. Thanks for the extra 50 TC! After the trade (sale) we went about finishing the prep for dinner, dinner and wine, and some lively conversation; eventually we called it a night. This morning we start the drive to Logrono, and the adventure continues. 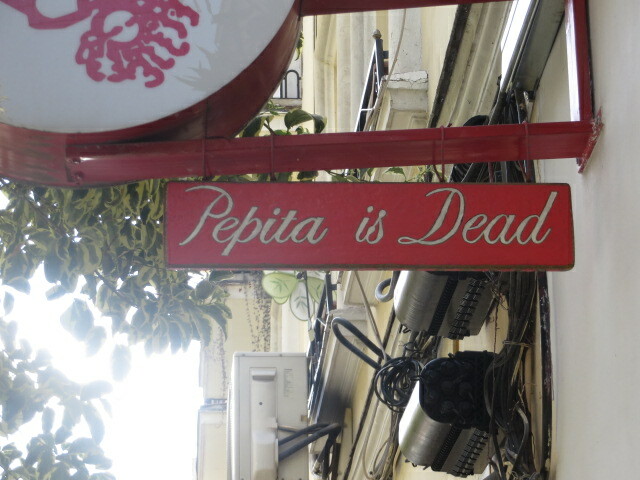 Pepita is still dead, but who knows what will turn up next. 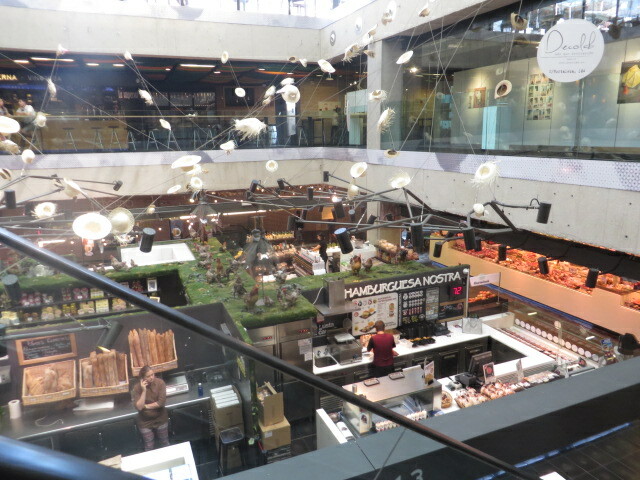 Yesterday consisted of a bit of walking around Madrid, and as is often the case when we travel (beyond corkscrews) our traipsing around involves visiting food markets. 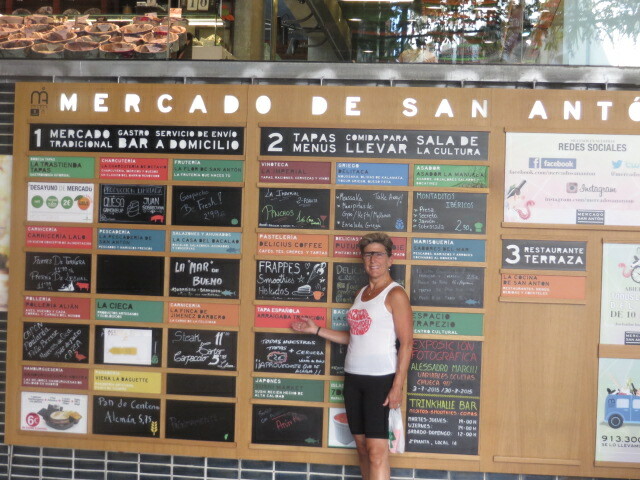 And, true to fashion, our morning began with seeking out Mercado de San Anton. Still, given that it was early in the day, and we didn’t want to carry that much, we figured we would return on our way home and stock up. 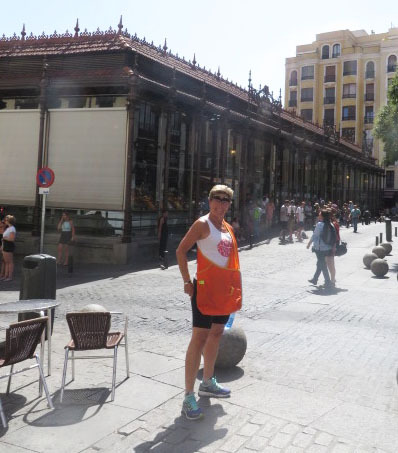 So, we headed off in another direction, enjoying the sights of Madrid–with our next stop being the Thyssen Museum. 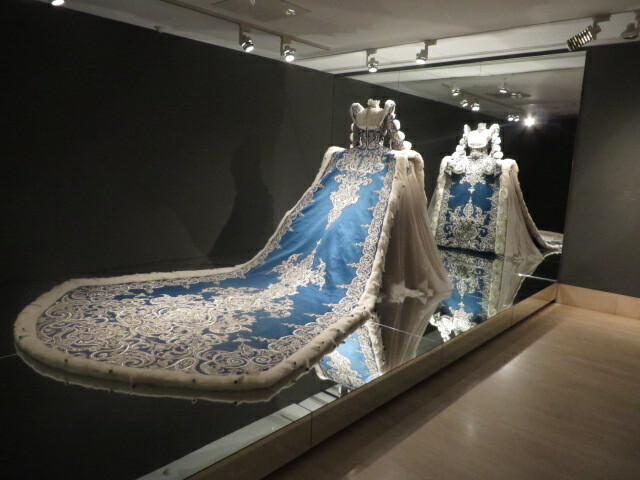 While they have a fabulous collection, they currently have Vogue like a painting exhibit which is also worth a visit! Following the Thyssen, and a much needed coffee, we were off again, exploring the city and oddly enough turning up at another food market! 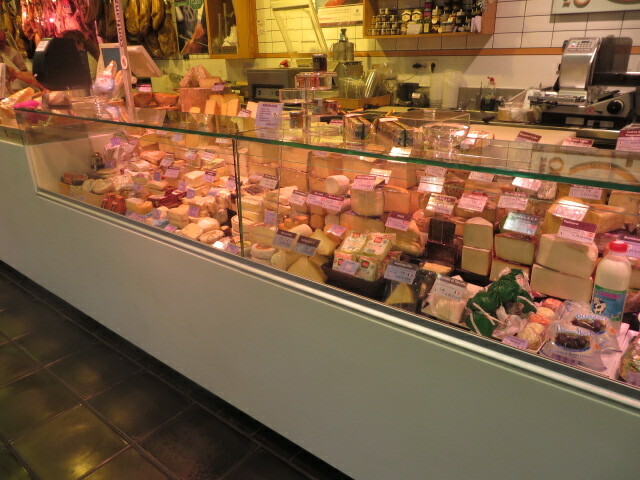 After exploring the stalls of Mercado de San Miguel, we both agreed that it was time for lunch and we preferred Mercado de San Anton… So off we went; retracing our steps and purchasing some semi-hard goat cheese, some Ribera del Duero and Rueda (why not have two bottles) a lovely tenderloin, and some potatoes and asparagus–this ultimately became dinner. A lovely day out and about. (yes, that is the lovely personal personal trainer in an Antique Archeology tank). As we are closing in on the halfway mark of the year–which in itself is a little hard to believe–I was going through the corkscrew case, and started looking at what might be the Best 6 thus far. For me, when I select my Best 6, is isn’t always the most valuable, or even the most scarce. Often it pertains to those that have the most appropriateness of fit in the collection. 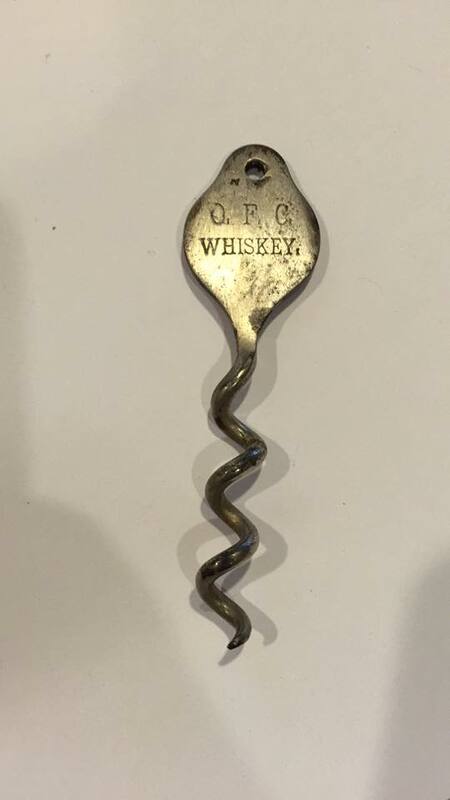 And, given the focus on those corkscrews patented in the United States of those that find their origins in the United States, an unusual Curley may make the list over an interesting Thomason for example. Still, given that these (most likely) won’t be staying in the collection, they (most likely) won’t be making the list. So, at this point, I am thinking the following are the Best 5 thus far. 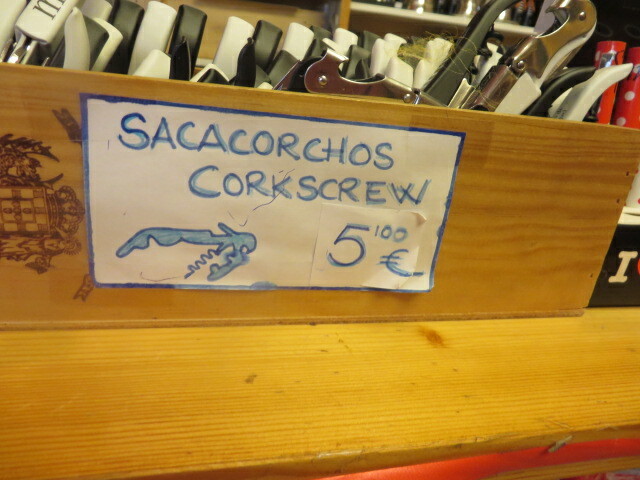 And, I have no doubt some of these will indeed make the list by the end of the corkscrew-collecting-fiscal-year. Of course, I have no doubt there will be still others added over the next 6+ months that will make the decision that much harder (or easier). We are still early in the year, with much hunting to be done. 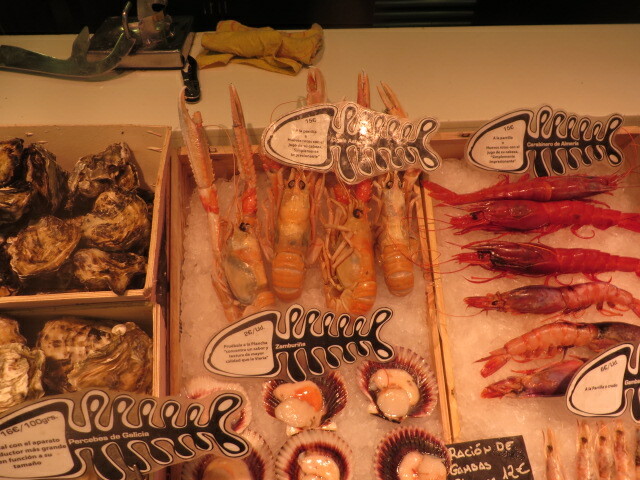 And, who knows what will show up in Spain and Romania at the AGMs? Or, what will turn up on my next trip to the mainland. Or, Brimfield. Or Union, Or, Montsweag, or….